After years of erratic efforts, Audi tries to crack the U.S. market - again. NEW YORK (Fortune) -- The U.S. luxury car market has been a bonanza for Mercedes and BMW as they have motored from one sales record to another. But the third German luxury brand, Audi, keeps making detours. Despite its backing by corporate parent Volkswagen, pioneering engineering developments like all-wheel drive and a strong performance elsewhere around the world, its stop-and-go efforts have caused it to get lost in the shuffle. Audi has lost money in the U.S. for years. The automaker has missed opportunity upon opportunity in the U.S. As long ago as 1975, it sold more than 50,000 cars here but 25 years later it had only gotten to 65,000. Lexus, by comparison, didn't get started until 1989 and today is selling around 300,000 vehicles a year. Audi has suffered revolving door management, inconsistent marketing and inattention to customer needs. While Lexus gets nearly half its sales from SUVs, Audi didn't get around to selling one, the Q7, until this year. Now, Audi is making another push with several new models. It is introducing a small SUV, the Q5, a small coupe, the A5, and a $130,000 mid engine sports car, the R8, over the next year and a half . Its goal: to boost unit sales from 83,000 in 2005 to 100,000 in 2008. Assuming the economy holds up, its targets look reasonable. Both BMW and Mercedes sell more than twice that many vehicles here. Audi competes most effectively in the compact luxury segment, where the A4 goes up against the BMW 3 series and Mercedes C class. Besides all-wheel drive, Audis are noted for their understated design and well-tailored interiors. But its formula is less successful in the upper reaches of the luxury segment, where the Audi A8 struggles against the BMW 7-series and Mercedes S-class. And it takes more than good products to succeed. Audi's reputation for quality lags that of its competitors. "You pay for your sins for a long time," says Johan de Nysschen, the head of Audi of Americas. Quality is getting better but older ones remain a problem. 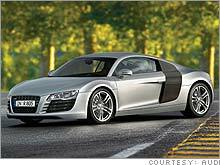 Audi ranked well below average in the latest JD Power dependability study of 2003 model cars. Audi also has to spend advertising money more consistently and not just lavish it on new product introductions. The relative weakness of its brand shows up in pricing, where Audi commands about four percent less per car than its competitors. It also needs to upgrade its dealers, many of which are dualed with Volkswagen outlets, and establish more single-brand outlets. For all its shortcomings in the U.S., Audi performs strongly elsewhere. Its brand is strong in Europe, where Audi's are seen as equals in image and performance to its better-known competitors and command similar prices. Audi has also moved aggressively overseas and has become the most popular luxury car in China. Overall, the company expects to sell 890,000 cars this year and is aiming for 1.4 million by 2015 - a position from which it might be able to claim luxury car leadership. Will Audi do better this time? Perhaps. But it still maintains some vestige of German know-it-all arrogance that doesn't serve it well. When talking about alternative fuels in a meeting with journalists in New York, Ralph Weyler, head of Audi's marketing and sales, declared that "this hybrid thing is a hype" and then in the next breath added that Audi would be introducing hybrid powertrains to satisfy the whims of its American buyers. Like Mercedes, Audi is a believer in diesel technology, though it hasn't developed a diesel engine that can meet emission regulations in all 50 states. To symbolize its latest sales push, Audi has remodeled its showroom on Park Avenue in New York City where it can display five cars. You can't actually buy an Audi there, though. For that you have to travel over to 11th avenue on the West Side to visit an independent dealer.